Based on the Korean folk tale “The Woodcutter and the Fairy”. Sun Ok Nam (Moon Chae Won) was a fairy in the Goryeo period. One day, while she was bathing at a waterfall, a woodcutter saw her and hid her clothes. Without her fairy clothes, Sun Ok-Nam could not go back to Heaven. She ended up marrying the woodcutter and they had two children together. After her husband died from an accident, Sun Ok Nam decided to stay and wait for her husband to be reborn in the hope that she can get back her fairy clothes. Now in the present day, Sun Ok Nam(Ko Du Shim) who is already 699 years old, still waiting for her reincarnated husband. She works as a barista and raises her daughter, Jung Song(Moon Chae Won) who is reborn as a tiger. 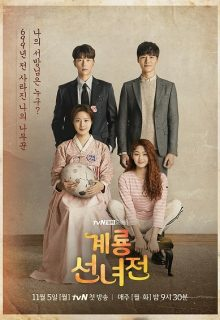 At her coffee shop Sun Ok Nam meets two men – Zhong Yi Hyun (Yoon Hyun Min) and Kim Geum (Seo Ji Hoon). She gets a feeling that one of them is her reincarnated husband, so she decides to follow them to Seoul to find out.